You are here: Home » Travel and Leisure » Is France the Ultimate Retirement Destination? Is France the Ultimate Retirement Destination? Almost one million former British residents now receive their British State Pension abroad, with Spain heading up the list of relocation hotspots and France taking the second slot. Those who chose the latter, though, would argue that France is undoubtedly the ultimate retirement destination for a wide variety of reasons. Firstly, it’s close to the UK! With a wide variety of flights to France leaving UK airports every day (plus solid rail and ferry links) it’s no problem for friends and family from back home to visit or vice versa. Once in mainland France, the internal air, road and rail infrastructures are also excellent, making it easy to get around. France is over twice the size of the UK but its population is only a little larger than our own, meaning that many rural areas in France are fairly isolated and many properties are still attractively priced. Property ownership rules and laws are also stronger and more transparent in France than some other European countries. 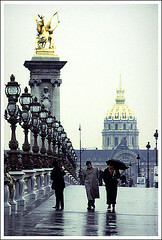 France is, of course, famed for its style, cuisine and culture and this remains true wherever you go in France. While millions of tourists take flights to Paris each year, the majority of visitors to France’s capital city never get to see anything else of the country – and there’s a lot else to see: some of the best skiing resorts in Europe; the lush countryside of the Bordeaux region; the spectacular scenery of the Alps; the sun-drenched Mediterranean beaches of Marseille, Cannes and Nice in the South. Obviously, France’s climate varies depending on the part of the country you choose to settle in but most people from the UK should be able to find a region of France which delivers the climate they prefer. Obviously, though, relocating yourself to a new country in your golden years is a big decision to take and there are a few issues that you should consider and research carefully before taking the plunge. If you don’t already speak the French language, get yourself booked into some classes soon. Speaking French is essential as you’ll quickly antagonise the locals if you don’t at least make an attempt to speak something other than English. As foreign languages go, basic French is not as difficult as you may remember from your school days, so don’t be too daunted to try. Another thing to consider is that an isolated French location may be the perfect spot for a relaxing two-week holiday but it can quickly turn into a real bore once you decide to live there. Do your research in advance to make sure that the area you choose to settle has enough going on to keep you interested and active. Finally, please ensure before you move that you are fully aware of how your pension or any other income (and the tax you pay on it) will be affected by your move. Unless you speak fluent French, it’s best to try to deal with any administrative tasks while still in the UK. Likewise, research the situation relating to your estate and any inheritance you plan to pass on to your loved ones and how French legislation may affect this. Retirement Alternatives: One of the most popular alternatives is Florida – perhaps Miami, Orlando or the Keys. Great weather, and lots to do. Big Discounts on Cheap Flights to Orlando with OneTravel,Book Today! Very sound advice. I would add that, as times are hard in France as well as in the UK, buyers would be advised to consider buying property with an income-producing element – like a gite or B&B facilities. Even a simple cottage next to the main house can bring in enough over the summer months to cover basic costs (tax, rates, electricity etc). Because, unless you speak excellent French, work is hard to find.